Last June I spent quite a bit of time in Yellowstone. A wolf den was visible in the distance along Slough Creek and I greatly enjoyed watching the daily pack activities including the playful pups. There was a very happy sense among the wolf watchers who travel great distances each year to watch the wolves through their scopes, making new friends along the way. 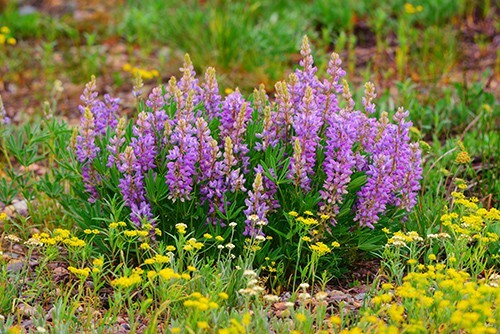 When I finally pulled my travel trailer south into the Tetons, I realized I had let the peak of spring Teton wildflowers slip past. More importantly, the day I arrived was marred by tragedy. Grizzly #399 is the matriarch of the Teton grizzly population. Last spring she emerged from her winter den at 20 years old with a new cub, soon nicknamed Snowy. 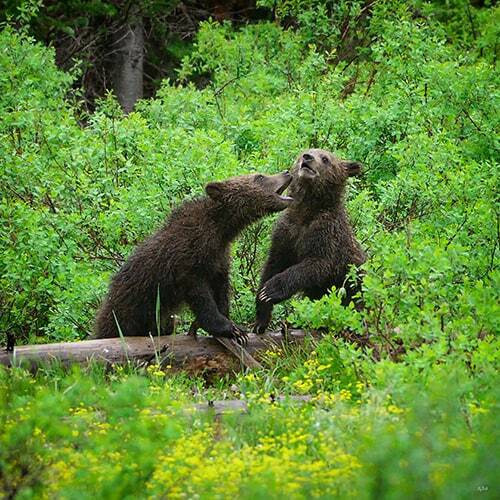 399 has raised generations of cubs within view of countless tourists and locals. 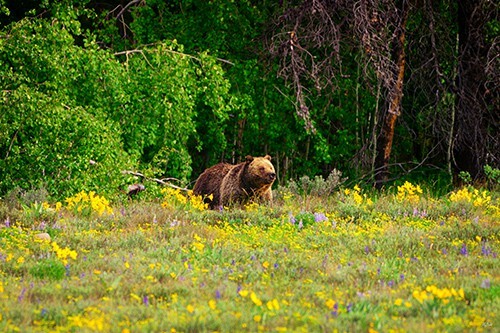 She learned long ago that keeping her cubs near the roads and people generally kept them safer than being in the remote backcountry where cubs are more vulnerable to being attacked by male adult grizzlies. At the ripe age of 20, many wondered last spring if Snowy would be the last of her cubs to be raised often in view of an adoring public. In the evening hours of June 19, Snowy was tragically hit by a car and killed. The adoring public was now in mourning as the somber prospect was realized that an end of an era might have prematurely arrived. I didn’t get to see Snowy. I had seen pictures from others and was anxious for the opportunity. By the time I parked my trailer, that prospect was gone and the joy of Yellowstone wolf watching seemed a distant memory. 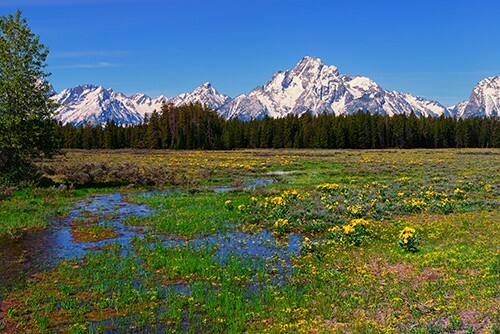 This year I set up camp in the Tetons in early June intending to get the wildflower shots I largely missed the year before. After a very snowy winter, creeks and streams have higher water than I recall ever seeing before. Wildflowers are everywhere. And to the delight of many, grizzly 399 emerged from her winter nap with not one, but two new cubs! During my first few days in the area I looked for spring wildflower shots when the sky looked nice. When cloudy or rainy, I looked for bears. The Pilgrim Creek road is unfortunately closed due to flooding. Hopefully the abundant moisture will bring back the lupines that have been missing in recent years in certain spots along the meadows. These shots are from the meadow along the western edge of Pilgrim Creek. Also in that area, the grizzly sow known as Blondie has been a frequent visitor, along with her two new cubs. Blondie seemed content to remain in the area for a few days. I watched her and the cubs several times very close to the main road. Eventually I caught up with 399 on the southeast side of Pilgrim Creek. It was certainly heart warming to see her two new cubs. I watched them spar, climb trees, and follow mom as she looked for food. Yesterday morning 399 seemed intent on crossing Pilgrim Creek and going farther north. One of the cubs had some difficulty swimming across the turbulent creek and got washed some downstream. Eventually she got both cubs across, and at one point the two rival sows were within a 1/4 mile of one another. Blondie soon moved on with her cubs. 399 confronted her on a few occasions last year and Blondie is quick to retreat when challenged. It will be interesting to see how the two might interact now since both moms have a pair of cubs each. I’ll keep fingers crossed that all four new lives will be safe near the roads and that we’ll get ample opportunity to watch them grow and mature over the years.